Melania Trump on Tuesday visited a charter school operated by the Gülenist Terror Group (FETO) in Oklahoma. 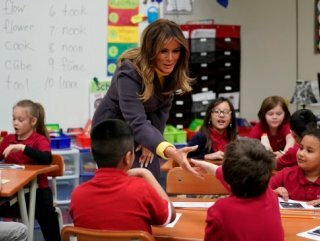 US First Lady Melania Trump on Monday visited a charter school in Oklahoma affiliated with the Gülen terror group as part of a multi-state trip to promote her “Be Best” initiative. 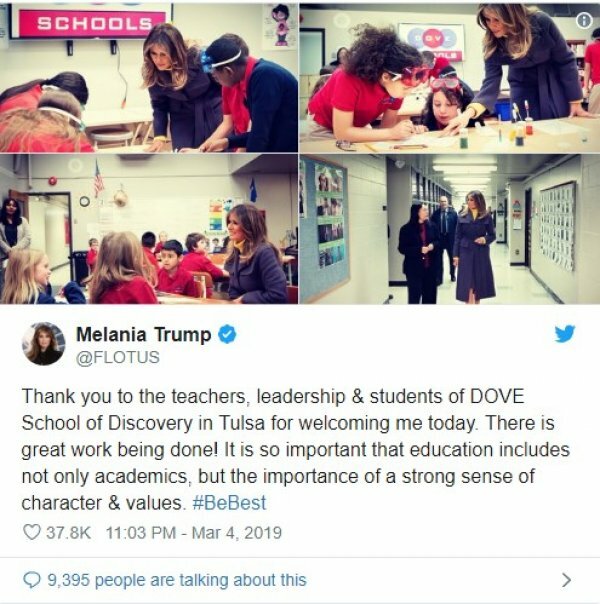 First Lady’s visit to The Dove School of Discovery in Tusla is part of a three-state trip promoting an initiative aimed at the well-being of children, social media use and opioid abuse, it said. "THERE IS GREAT WORK BEING DONE"
"Thank you to the teachers, leadership & students of DOVE School of Discovery in Tulsa for welcoming me today. There is great work being done! It is so important that education includes not only academics but the importance of a strong sense of character & values. #BeBest," Melania Trump wrote on Twitter. FETO and its US-based leader Fetullah Gulen orchestrated the defeated coup of July 15, 2016, which left 251 people martyred and nearly 2.200 injured. Ankara also accuses FETO of being behind a long-running campaign to overthrow the state through the infiltration of Turkish institutions, particularly the military, police, and judiciary.